It is halfway through the twenty-first century in America and religion has become a thing of the past. Beyond the dreary skies, which are known well to those in the year 2041, lies the Kingdom of Heavenly Creatures. But for one boy, only 12 but yet quite astute for his age, those same dreary skies part and shine light on the realities from beyond. A new land gives new hope and reveals a glimpse of His plan. Is heaven what Timothy Petrov always envisioned it to be? Yet, aside from the quirky behavior of the creatures beyond, there exists still an order that sheds perspective on the quality of creation. A creation that possesses organization, much like what humans on earth attempt to perfect, only in this case it is without flaw. The three-leveled angelic hierarchy is rather complex, however at the same time it is only the outer shell of an existence that Timothy will soon discover himself to be intertwined with. And as organized as it is, there are still exceptions to be discovered, for the first angelic creature he meets has a special title: Eryana, Arch-guardian of the Elders. Book #1 in the Parables of the 24th Elder Series, The Prophecy of the Sacred Cross reveals the glimmer of hope that is within all of us when dark times to come would suggest otherwise. Through fantastical concepts grounded by faith, this epic novel opens a new door to possibilities that would seem otherwise out of reach. Experience Peter Silas’ debut novel early on, and be part of a mystical journey that does not hold back on its central focus of love in Christ. For all age groups, including teen/young adults, adults and anyone seeking for a new perspective on what the future holds for us and our faith. Be amongst the first to discover how a boy embarks on an unparalleled journey. 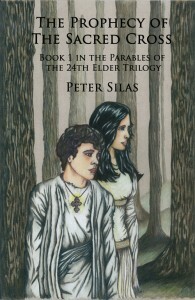 “Peter Silas has done something really quite remarkable in The Prophecy of the Sacred Cross. Not only has he created a Christian fantasy in the genre of Lewis’ Narnia tales, but he has set it within the context of the Eastern Orthodox Church. This is a first, as far as I know. While the American literary audience has some familiarity with Eastern Orthodoxy in its Greek or Russian expressions, few have much experience with an American Orthodox Christianity – of which Silas declares himself a member. The Prophecy, the first of a trilogy, centers on twelve year old Timothy Petrov, an American Orthodox Christian, at a time in the future when public Christianity is discriminated against and even punished. Timothy, who undergoes the struggles of any good and shy Junior High Schooler, is unexpectedly taken up into the heavenly realm and must accomplish three objectives that will determine the future of the world. The action unfolds alternately on Earth and in the heavenly realms. The work has the excitement of a developing quest in a fight of good against evil, of angels against demons. It accurately incorporates aspects of Eastern Orthodox structure and spirituality. Book #1 in the Parables of the 24th Elder Trilogy, The Prophecy of the Sacred Cross reveals the glimmer of hope that is within all of us when dark times to come would suggest otherwise. Through fantastical concepts grounded by faith, this epic novel opens a new door to possibilities that would seem otherwise out of reach. Experience Peter Silas’ debut novel early on, and be part of a mystical journey that does not hold back on its central focus of love in Christ. Are you a young adult, or a parent of one, looking for fantastical concepts grounded by faith? The Parables of the 24th Elder Trilogy offers this unique combination, that will take you on an exciting adventure. Unlike other epic fantasy sagas, The Prophecy of the Sacred Cross imbues the mystery of the Holy Trinity into a new world that is comprised of science fiction, mystery, suspense and fantasy. Be the first to discover how a boy embarks on an unparalleled journey into the unknown through his faith and kindness. The time has come again for an original, intellectual novel to make its way into your Christian fiction collection. Experience the battle of good vs. evil again; a journey alongside a conservative Christian flavor that does not hold back a central focus in the love of Christ. Tap into the young adult genre all while being overtaken by an in-depth, challenging plot line flavored by abstract Christian concepts. The Parables of the 24th Elder series is far from pandering or proselytizing; allow yourself exposure into a different perspective without feeling that you are being preached to. Enjoy an exciting tale that relates the world you live in to the possibility of something beyond, and use it to catapult your curiosities into the unknown realms!